I decided to make a second chemisette for this years Jane Austen Festival, using Janet Arnold’s pattern (A. c. 1800-25) in Patterns of Fashion 1. 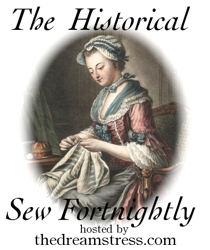 I have also joined a Historical Sew-Fortnightly, hosted by Dreamstress, which I am hoping will help me sew more historical garments through the year. 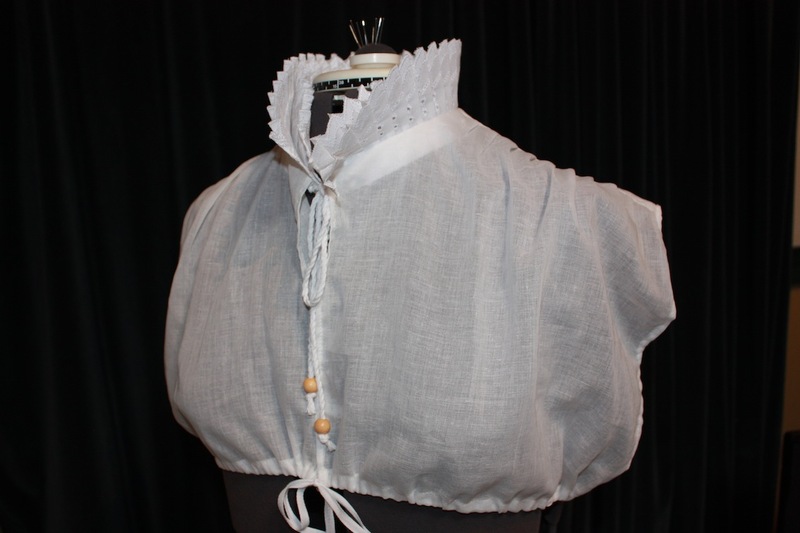 This garment is for the #1 challenge – making something that would have been worn in __13, in my case it is for the year 1813. For my previous chemisette, I had used the same pattern but had mistakenly thought that the garment required pin-tucks down the entire centre front. 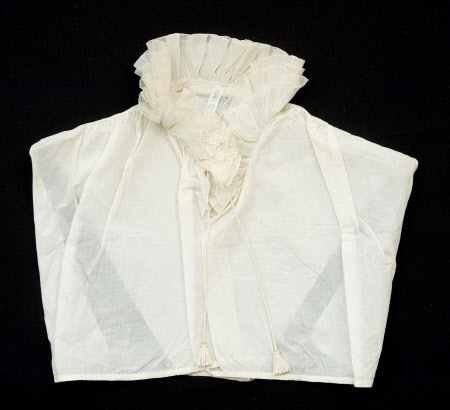 After seeing a picture of the garment online (pictured right), it could be seen that there were instead just small tucks in the material along the shoulder seam. So I made a series of 1/8″ tucks every 1.5cm or so along the shoulder of the front panel. This created a type of gathered puffy look to the front, which I presume was to give a bit of shape or movement to a garment that really has no shape at all. The shoulder seam tucks in the front panel. The fabric I used was premium cotton muslin, which is nice and thin and resembles the weight of the fabrics used in period chemisettes. For some reason, the cotton lawn and cambric made these days does not seem as thin as it seems from extant examples. The construction steps were virtually the same as my previous chemisette. One of the main differences was in the construction of the frill. For my first attempt last year, I had used a pre-pleated organza lace as the frill, but this time I decided to try pleating a length of cambric lace with some Broderie Anglaise on it. 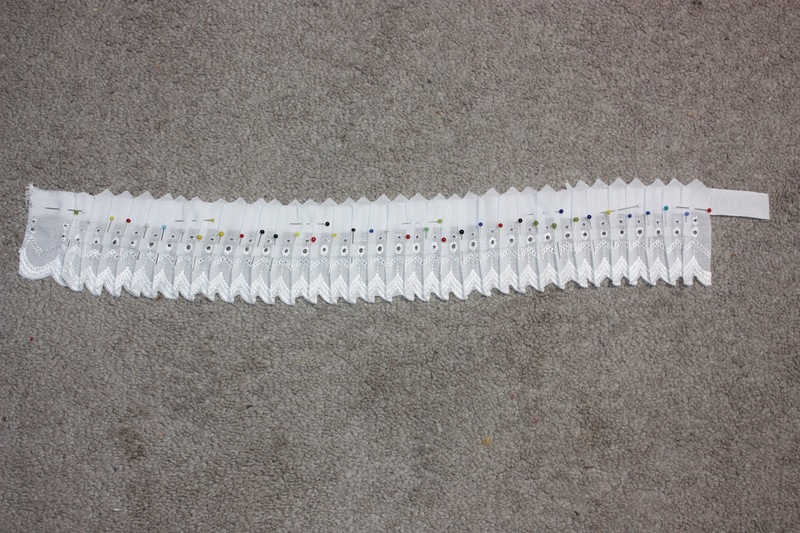 The frill has two layers, graduated in height, attached to a length of cotton tape 20mm wide. 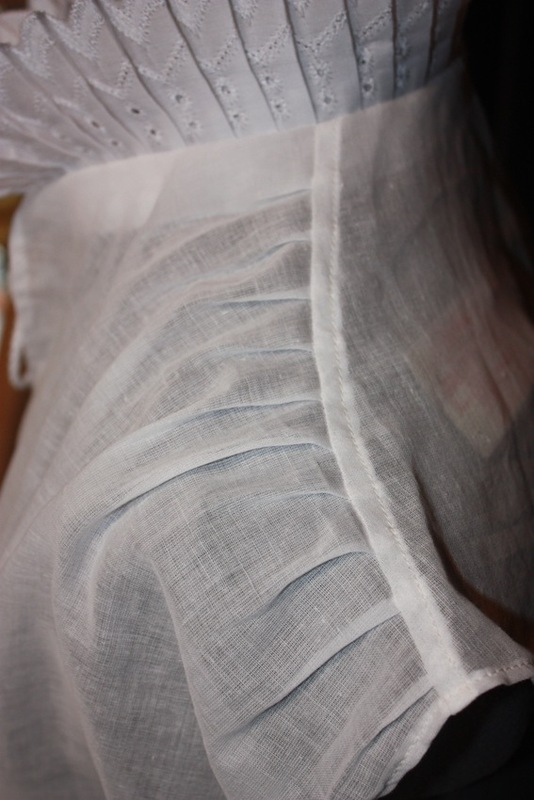 One layer of lace, pleated, ironed and pinned to a length of cotton tape. The finished chemisette has a lovely striking collar, which stands up nicely! 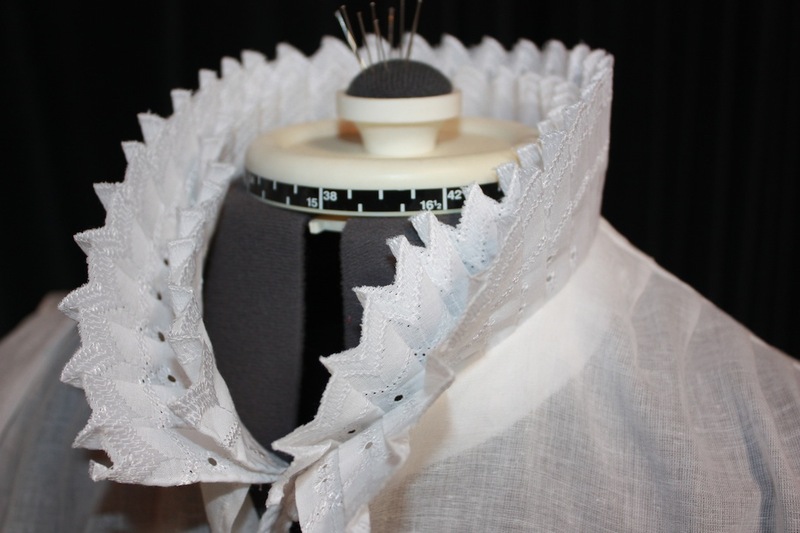 It is not really period correct, as I have not seen embroidery on collars like this in any extant examples and usually the pleating is much finer (mushroom pleating), but this was at least easy to construct and will be easy to re-iron after laundering! I also threaded some wooden beads onto the ends of the cotton cords which tie up the neckline, which looks a bit more interesting than just having knotted cord. The bottom edge is tied together with a length of 5mm cotton tape. I was quite pleased with the effect! This only took two days to complete (maybe 16 hours in total) and cost $8 AUD to make. I would like to try the second Regency chemisette pattern (B. c. 1800-25) in Janet Arnold’s book next time. If you would like more information on the construction of my chemisettes, go to my previous post, My Regency Journey: Making a Chemisette. 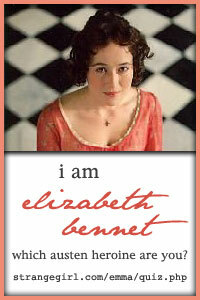 To see more of my Regency costuming, go to My Regency Journey.